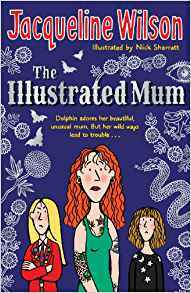 The first person narrative by a young girl, Dolphin, features her manic depressive mother Marigold, nicknamed "the illustrated mum" because of her many tattoos. Dolphin and her older sister Star have to be a mother to their own mother. The mother soon becomes a burden to the two girls. Not only is she bi-polar, but she doesn’t always come home at night. The girls confront a severe mental illness and have to be in charge of their own world. We have here a first person narrative from a very young person. First person narratives are normally for teens and young adults. Even the younger child is more grown up than the mother. As Marigold gets yet another tattoo, we get a real sense of her being the child and of narrator Dolphin being the adult. Star rejects the parenting role when she and Dolphin argue about her weekend away. Finally Marigold paints her body all over with white paint in order to bury the tattoos and become a good mother. Dolphin has to cope with this on her own. As Marigold is taken away in an ambulance, she sinks further. While Marigold is in hospital Dolphin has to fend for herself and avoid social services. Marigold does come home after her birthday. She insists on making cookies for the girls. They are still more adult than her, however, as she takes a childish delight in the cookie-making endeavour and spoils at least two batches. The kitchen is a total mess. Marigold’s mental health problems are always a challenge: she cuts herself and gets blood-poisoning but the girls dare not take her to A & E because they are afraid she’ll be sectioned. We learn that Marigold has already been institutionalised and that it didn’t go well. Marigold is dysfunctional in all sorts of ways. She manages money badly and we suspect she has stolen a credit card. She is often irresponsible. She insists on taking Dolphin to Brighton to look for Star’s father Micky. She has no clue as to exactly where he lives but she does know that he has a live-in girlfriend. Dolphin becomes tired and hungry as they wander around Brighton aimlessly. Dolphin cries and Marigold slaps her. Micky actually drives Star back. Marigold makes an effort to seem normal but he doesn’t give her a second glance. We feel her sadness. There is a real threat to the family unit. Micky has asked both Star and Dolphin to live with him but Dolphin wants to stay with Marigold. The reader knows that when Star goes to Micky for a second weekend she is not coming back. We suspect Marigold knows this as well and young people have to witness an adult crying. Later Marigold is in denial as she buys new clothes for both girls and paint to redecorate their room. Life is frequently bleak for the two girls. The rental firm takes their television back because Marigold hasn’t kept up with the payments. As if life isn’t bleak enough, Dolphin is also bullied by other students at her primary school. She upsets Ronnie Churley because they both get 0/10 for a letter-writing exercise in which she had failed to participate properly. The bullying is brutal. They can’t really ask friends round to the house. Their flat is small, even though it is actually the best one they’ve ever lived in. Their neighbours are elderly. The flat is otherwise nice enough but it means Dolphin has to go to a difficult school. Marigold reaches out to one of Dolphin’s classmates, Tasha. It falls flat. Marigold and Dolphin are rejected by both Tasha and Tasha’s mother. Even the fairy story that Dolphin and Marigold share is Hansel and Gretel, a gruesome offering where there is cruelty to children and the children commit murder. When Micky, Star’s father, comes into the story, it difficult for Dolphin. She does not know who her father is and Marigold won’t tell her. This gives us the clue as to why Dolphin narrates the story. She is the outsider and it is painful. Surely even the younger reader feels pain on Marigold’s behalf when Star’s father Micky pays for Dolphin and Star to go to Brighton but not for Marigold. It becomes Dolphin’s problem, again, however. Because Marigold has to stay at home, so does Dolphin. We do see some mitigation in this text. Marigold’s biscuit-making and cake-making are an act of love. Dolphin sees the angel cookies go into the oven as “real works of art” Later when they turn the left-over cake into a gingerbread house Marigold and Dolphin play together making the house and inventing a story about two mice living there. Dolphin becomes tough. She can hand out the insults too. She names one boy Owly Morris because of his thick-lensed spectacles. When Kayleigh names her “Bottle-nose” she names Kayleigh “Camel Breath”. She actually befriends Owly and starts calling him by his real name: Oliver. Oliver helps her to find her father, Michael. Michael wants to do everything by the board. He wants to contact social services and discuss having Dolphin to stay with his family. It doesn’t happen straight away, however. Dolphin has to go to a foster home to start with. We’re not allowed to become too complacent. Star is also brought to the foster home and she and Dolphin have a terrific row. However, Auntie Jane, the Foster mother, manages to help them to laugh at themselves.